London has one of the densest concentrations of museums in the world. These range from big names like the British Museum and Tate Modern to the smaller places with unique collections. Most of them have vast permanent collections of great international art, history and culture and they’re free to enter. Here’s a roundup of the capital’s best art institutions. This is one of the world’s oldest museums and it contains an immense collection of objects—so many that only a small portion of them can be on display at a time. Must-sees include the mummies, the Lewis Chessmen and the Rosetta Stone. Another highlight us the Sutton Hoo, which is the centerpiece of the Sir Paul and Lady Jill Ruddock Gallery—where the museum’s very early medieval (AD300 to 1100) collection from Europe is displayed. Another part of the British Museum’s permanent collection is the Discovering the World in the 18th Century exhibition. Displayed in the former King’s Library, the exhibition includes around 5,000 objects from the mid-eighteenth century through the early-nineteenth century, which was a time filled with lots of discovery and education. Over in the Wellcome Trust Gallery is the Living and Dying permanent exhibition, which explores the way disease and death has been diagnosed and coped with throughout history. Admission to the British Museum (pictured above) is free. Founded in 1989, the Design Museum is the world’s top museum dedicated to contemporary design like architecture, graphics, multimedia, industrial and fashion. Attracting more than 200,000 visitors annually, the museum champions creative thinking and the importance of good design in every day life. There are a series of changing exhibitions, from fashion to furniture, which celebrate the world’s best designers and architects. The museum’s annual Design of the Year exhibition shows the world’s design innovations produced over the previous 12 months. Previous Designs of the Year have included the Barack Obama poster designed by Shepard Fairey and the Heydar Aliyev Center in Baku, Azerbaijan designed by architect Zaha Hadid. The museum’s Blueprint Café has a balcony overlooking the Thames. Unlike most museums in London, entrance is not free, as the Arts Council doesn’t subsidize it. This powerhouse of modern art was formerly a Bankside Power Station designed by Sir Giles Gilbert Scott after World War II. Nearly 20 years after the power station was shut down in 1981, it opened as an art museum and has been extremely popular ever since, establishing itself as one of the most-visited art galleries in the world. 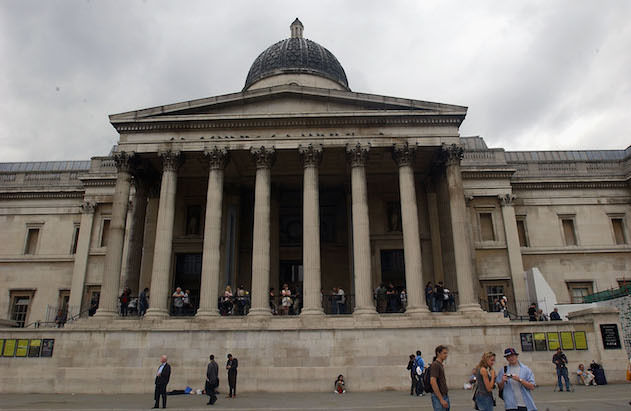 Around five million visitors flock to the museum each year to view the Tate’s major collection of international modern and contemporary works of art. Its comprehensive collection of modern international art since 1900 includes one of the best Surrealism assortments, with works by Dalí, Magritte, Miró, Matisse, Rothko and Warhol. The permanent collection is free to enter. At the top of the museum is a restaurant with one of the best views in London, perfectly framing the River Thames and the city center. Home to more than 2,000 works, the National Gallery, which was founded in 1824, contains masterpieces from nearly every European school of art. The Sainsbury Wing displays the gallery’s earliest works and includes pieces by Italian masters like Giotto and Piero della Francesca. The Sainsbury Wing also has temporary exhibitions. The seventeenth-century Dutch, Flemish, Italian and Spanish old masters’ works are in the North Wing and Italian Renaissance masterpieces by Correggio, Titian and Raphael are in the West Wing. The gallery’s most well-known and admired paintings by French Impressionists are in the East Wing and include Van Gogh’s sunflowers series and Monet’s water lily paintings. The museum also has a cafe and a fine-dining restaurant. Entrance to the museum is free and there are also free guided tours and audio guides. This East End gallery has been a staple in London’s contemporary art scene since 1901. For over a century the Whitechapel Gallery has premiered the talents of modern masters including Jackson Pollock, Frida Kahlo and Mark Rothko and contemporaries such as Sarah Lucas, Paul Noble and Sophie Calle. The gallery reopened in 2009 following a major redesign of its Grade II-listed building, which transformed it into a mecca for art with beautiful galleries, a research center, education resources, courses, historical archives, a cafe/ bar and a bookshop. The gallery is open all year round with a rotation of innovative and challenging exhibitions that are free to enter. This entry was posted in Art, Culture, Hatty Copeman's articles, Travel and tagged architecture, Art, Art London, Artist, Artists London, best museums, design, London, museums, Travel tips by Harriet Copeman. Bookmark the permalink.